По мере того, как устройства и интерфейсы становятся все более сложными и быстродействующими, генератор сигналов произвольной формы M8195A обеспечивает гибкие возможности по созданию сигналов в области перспективных исследований, для цифровых приложений, оптических и электрических систем связи, широкополосных радиолокационных систем и средств спутниковой связи. 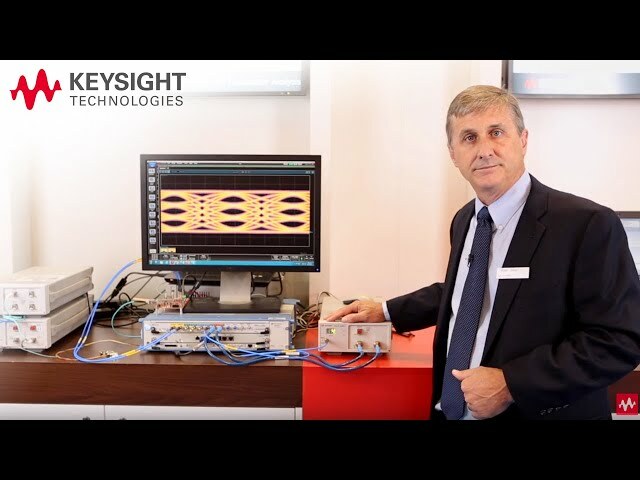 Быстродействующий генератор сигналов произвольной формы Keysight M8195A имеет аналоговую полосу частот до 20 ГГц, частоту дискретизации до 65 Гвыб./с и до 4 каналов в каждом 1-слотовом модуле в формате AXIe. По мере того, как устройства и интерфейсы становятся все более быстродействующими и более сложными, генератор Keysight M8195A обеспечивает гибкие возможности по формированию сигналов, используемых в области разработки цифровых приложений, в ходе перспективных исследований, для тестирования широкополосных радаров, средств спутниковой связи и оптических систем передачи данных. Уникальный режим реального времени позволяет сократить время тестирования в сотни раз. Фильтры с конечной импульсной характеристикой и другие функции цифровой обработки сигналов используются для формирования импульсов и изменения экстремальных условий тестирования оптических систем, например, поляризационной модовой дисперсии (PMD) или величины фазового шума. 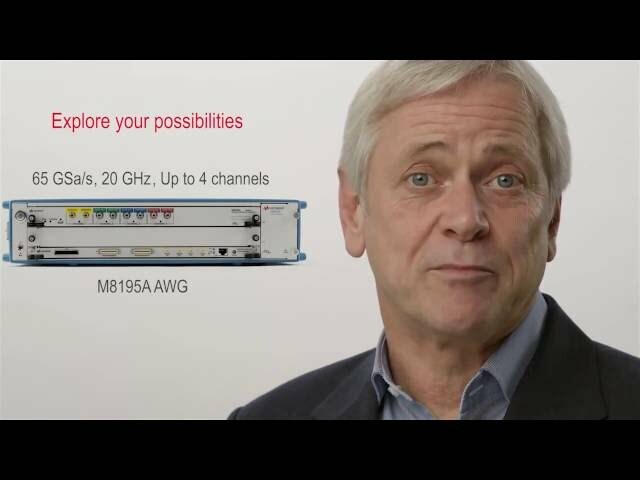 Генератор сигналов произвольной формы Keysight M8195A — это повышение эффективности тестирования многоканальных высокоскоростных устройств благодаря возможности использования режима реального времени, функции создания последовательностей и глубокой памяти. Генератор сигналов M8195A может поставляться в составе системного комплекта M8195S, который обеспечивает гибкую конфигурацию в зависимости от необходимого количества каналов. Помимо самого модуля генератора конфигурация системы включает шасси в формате AXIe, встроенный контроллер или средства подключения к внешнему компьютеру. 1. Interpolation is performed by FIR filters in hardware. For 2x (4x) interpolation, samples are read from memory at a rate up to 32.5 GSa/s (16.25 GSa/s) and interpolated to a DAC sample rate of up to 65 GSa/s. For interpolation = none, the sample rate from memory is the same as the DAC sample rate. 2. With default FIR configuration the maximum sample rate is calculated as 80% of Nyquist. 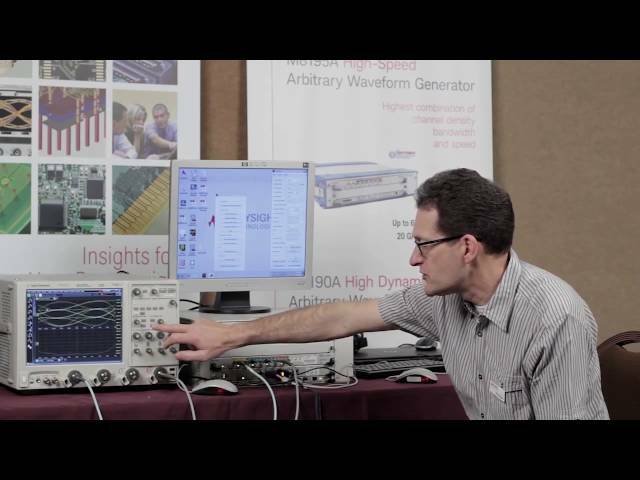 With custom FIR configurations higher output frequencies can be achieved. 4. Unused output must be terminated with 50 Ω to GND. In case the termination voltage is not GND, the unused output must be terminated to VTerm. 5. Sample rate 64 GSa/s, output amplitude 500 mVpp(se). 6. Termination voltage = 0 V; adjusted at 23 °C ambient temperature, amplitude increases by 0.2%/°C (typ) for ambient temperature below 23 °C. 7. Termination voltage = 0 V.
8. 10 GHz clock; 1 V ampl. ; 60 GSa/s. 1. Sample rate 64 GSa/s, output amplitude 500 mVpp(se). 2. Measured with a balun (e.g. HL 9405). 3. Measured at Data Out. The sample memory can be split into a maximum of 16 M waveform segments. 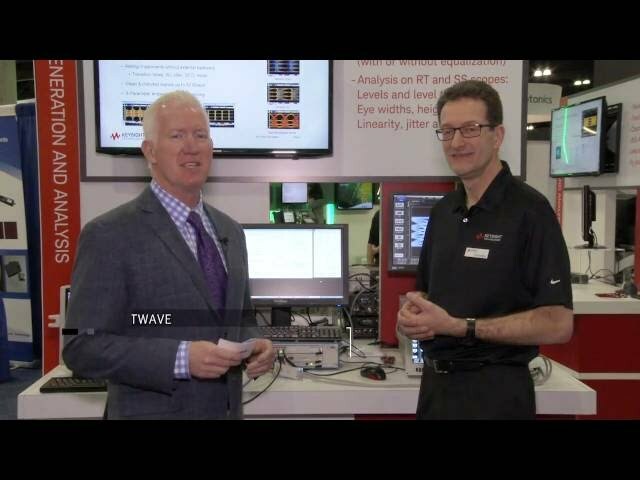 Waveform segments can have different sizes, but the segment size must be the same across channels. The sequence table can contain up to 16 M entries (sequence IDs). Ext. Memory One or more waveform segments are arranged in a linear sequence. Each segment can be repeated a programmable number of times or until an external event is signaled. A trigger/gate input is provided on the front panel of the M8195A and the M8197A. The trigger input is used to start/gate waveform playback. The “Trigger output” and “Event input” functions share the same connector on the front panel. 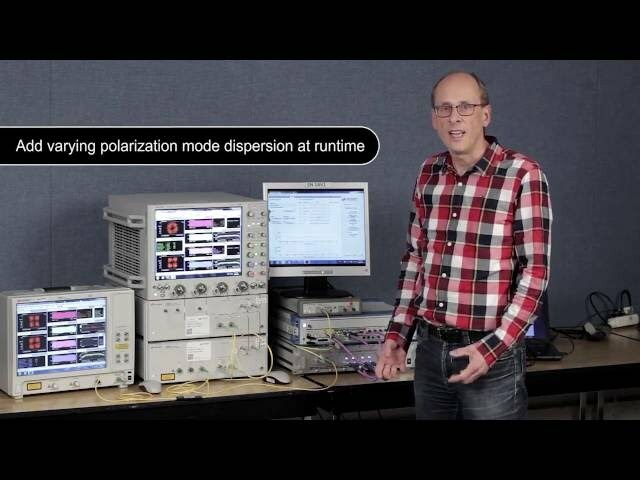 The “Trigger output” functionality is only used in conjunction with the 81195A Optical Modulation Generator Software. For details of using the “Trigger output” functionality, refer to the 81195A data sheet und user guide. The sequencing of a single M8195A can be controlled with the ‘Trigger/Gate Input' as well as the ‘Event Input' of the M8195A. In a synchronous system that consists of one M8197A and up to four M8195A, the sequencing of the entire synchronous system can be controlled with the ‘Trigger/Gate Input' as well as the ‘Event Input' of the M8197A. A single M8195A or a synchronous system can operate asynchronously or synchronously. In case of synchronous operation, a timing requirement between the Reference Clock Output and ‘Trigger/Gate Input' or ‘Event Input' must be met. –– The sample clock delay can be changed in discrete steps. The step size is 1 / DAC Sample Frequency. E.g. the step size is 15.625 ps for a DAC Sample Frequency of 64 GHz. –– The FIR delay can be used for sub sample delay adjust. Note: This delay functionality uses a digitally implemented FIR filter with limited length and accuracy. As a result the output signal may show some degradation when using the FIR delay adjust. In order to compensate for external cable length differences as well as the initial skew, channels 1,2, 3 and 4 can be jointly delayed with a very high timing resolution. In case the M8197A synchronization module is used to configure a synchronous system, the variable delay can be used to align the channels of multiple M8195A modules. Modifying the variable delay always affects the delay of all four channels. E.g. setting the variable delay to 10 ps has the following effect. Out 1, 2, 3 and 4 are delayed by 10 ps with respect to trigger/gate input and event input. The clock reference input is provided on the front panel of each module. The clock reference input of the M8195A is used as the clock reference for all four channels of that M8195A. The clock reference input of the M8197A synchronization module is used as the clock reference for all channels of all M8195A that are combined in a synchronous system. The clock reference output is provided on the front panel of each module. 1. Reference clock output phase shifts when the variable delay is changed. 2. For M8195A: Reference clock output remains unchanged when the variable delay is changed. 3. Warm-up time 2 minutes min. 4. fSa = 64 GHz; reference clock source: internal. Download speed is measured by transferring the samples from the controlling PC's memory into the M8195A. The M8195A and M8197A are controlled by a combined soft-front panel and firmware application that runs on an embedded AXIe controller or external PC or laptop. 1. Warm-up time 2 minutes min. 2. fSa = 64 GHz; reference clock source: internal. 3. Using M9048A PCIe adapter. 4. Download of waveform samples without marker information. The warranted performance of a calibrated instrument that has been stored for a minimum of 2 hours within the operating temperature range of 0°C to 40°C and after a 45-minute warm up period. All specifications include measurement uncertainty and were created in compliance with ISO-17025 methods. Data published in this document are specifications (spec) only where specifically indicated. The characteristic performance, which 80% or more of manufactured instruments will meet. This data is not warranted, does not include measurement uncertainty, and is valid only at room temperature (approximately 23°C). The mean or average characteristic performance, or the value of an attribute that is determined by design such as a connector type, physical dimension, or operating speed. This data is not warranted and is measured at room temperature (approximately 23°C). An attribute measured during development for purposes of communicating the expected performance. This data is not warranted and is measured at room temperature (approximately 23°C). Represents the traceable accuracy of a specified parameter. Includes measurement error and timebase error, and calibration source uncertainty.